"I was never able to sing, I was never able to write songs. But I always got a kick out of piecing together stories with bits of records." Eric San aka Kid Koala is a one-of-a-kind sort of turntablist. There's the fact that he's an illustrator, graphic artist, film maker, puppet master and musician. There's the fact that he always wear shorts. Then there's the fact that he sees his chosen means of expression not as a way of showing that he can do faster crabs than anyone else, but as a way of telling stories. 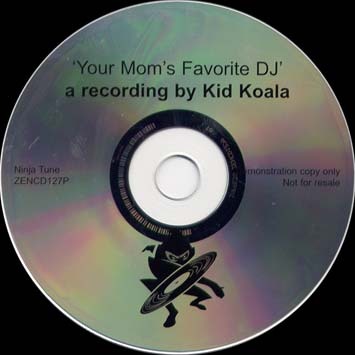 And here he is, with another story, a semi-autobiographical one, obviously, as it's undoubtedly true that if your mom had a favourite DJ, it would be Kid Koala. And if you want to take that as a snap, well then be our guest. This fresh-faced Kanadian Kasanova can play it however you like. Ma'am. Although there is the romance, silent movie comedy and swing that your mother may well smile at and even shake her booty to, the enthralling deftness and complexity you'd expect from Kid Koala is also here - woven together with classic hip hop beats, breaks and generous swathes of heavy guitars. It looks back to the seminal "Scratchcratchratchatch" cassette of a decade ago and the Kid's first full release, "Scratch Happy Land" (as well as referencing his multimedia project "Nufonia Must Fall"). But it also, in ways we won't even explain yet, hints at the many projects Mr San has to come. There are references throughout to a book about a clarinet-playing mosquito that Eric is currently working on, plus to the musical puppet show he has in development (honest). And there are also some "tests" from a new group called Slew. But don't worry too much about second-guessing stuff that will become clear later. 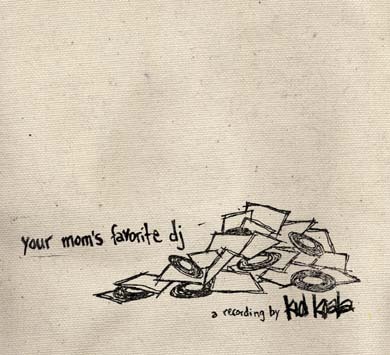 Instead focus on the small but perfectly formed delights of "Your Mom's Favorite DJ". Try to follow the stories, headnod to the beats (Eric has always liked his beats), develop your own Charlie Chaplin routines, snigger at the vocal samples, marvel at the dextrousness of the vinyl manipulation, but most of all, enjoy the complete ease and class with which the whole thing is put together.